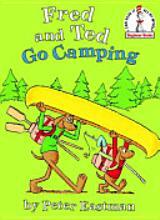 Click on the "Teaching with Picture Books" tab above to see how I will be using the book Fred and Ted Go Camping by Peter Eastman to teach antonyms to my second graders. Reward Coupons & Brag Tags: Behavior Management Made Effortless, Engaging, & Fun! Back to School - Tips for a Great Day! The Accidental Teacher, Mom, Runner . . .
Whoo's Got a New Blog Design? Erica's Elementary Excitement! !..and Whole Brain Teaching! !